Control of water quality is the key factor for a successful culture of aquatic animals like fish, prawn, and shrimp. An open water system with sufficient good water quality may ensure successful aquaculture. However, if the proper quality or sufficient quantity of water is not available, purification of water by eliminating polluting substances including toxic metabolites and growth inhibiting substances which originate mainly from fish or shrimp excretion and excessive feed is necessary. Under this lower water quality conditions, there are chances for occurrence of mortalities by diseases due to viral, bacterial, protozoa, fungal pathogens. High populations of aquatic animals can be kept healthy under successful semi-closed and closed systems by maintaining proper sanitization. The increased demand for water quality and quantity in shrimp and fish culture has resulted in a growing interest in using water sanitizers and disinfectants. Chlorine dioxide is highly effective in controlling waterborne pathogens. Chlorine dioxide is a broad spectrum micro biocide as effective as chlorine against viruses, bacteria & fungi. Rapid Oxide Tablets has broad spectrum capacity to kill microbes which includes Biofilm, bacteria, viruses, yeast, fungi, mold, spores, epiphytes, protozoans, cryptosporidia, actinomycetes, cysts, and other diseases. Microbes will never become resistant to Rapid Oxide as Rapid Oxide penetrates the cell wall and decomposes polypeptides and breaks the bond in microbial proteins, RNA and DNA to kill all microbes. Rapid Oxide controls the Disease and helps in weight gain. Reduce the mortality rate in fish and shellfish stocks. Rapid Oxide eliminates odor and provides clean water and air by reacting with amines and sulfides in breeding water, air and on the surface of fish and shrimp or any materials. Rapid Oxide has no side effect even on superior species of fish and shellfish stocks. As a strong oxidative agent, Rapid Oxide will decompose almost all reductive materials in water. This includes residual feed and excrement, resulting in an improved environment in breeding aquaria and ponds. Rapid Oxide also enhances the concentration of dissolved oxygen. The net effect is to prevent the breakout and promulgation of epidemics in fish and shellfish farming. Liquid Chlorine Dioxide is recommended by US EPA, FDA etc. as a sanitizer or Biocides. It has is used in so many industries directly related to human health. Rapid Oxide can be applied to Pond water via a solution dispersed or spread through the boat, oxygenating fountain or foam raft. Disinfection of a feeding pond, after removal of dirty mud at the bottom of the pond and before the pond has been refilled, simply spray concentrated Rapid Oxide onto the pond bottom and walls for complete disinfection. Disinfect the refilling water with the help of the dosing pump or putting the measured quantity of Rapid Oxide based on pond water quantity. Regular dosing of Rapid Oxide to control the viral, virus, bacterial and epiphyte diseases. The use of chlorine dioxide in cooling towers, loops, and cooling systems greatly assists in the control of algae, planktonic bacteria, bio-film and scale, helping to maintain the efficiency of heat exchanger surfaces, reservoir intakes, and ancillary equipment. Traditional oxidizing agents such as chlorine and bromine suffer from pH constraints and corrosion problems. Chlorine dioxide is significantly more stable than other oxidizing biocides and is also compatible with most water treatment chemistry. Chlorine Dioxide controls algae, planktonic and sessile bacteria, and bio-film. Why is it important to control bio-film in such systems? Bio-film acts as an insulator causing deterioration in general heat transfer properties. It creates fouling and corrosion problems by accumulating scale in pipework and equipment. Bio-film also creates an environment that promotes the growth of anaerobic microorganisms which in turn increases microbiologically induced corrosion (MIC) problems. Using chlorine dioxide will lead to significant cost savings including water cost, corrosion problem, reduce maintenance cost and Improved system performance. Decontaminating pharmaceutical manufacturing facilities is essential for producing safe and pure drugs. The most commonly used decontaminant in the industry has been sublimated formaldehyde. In June 2004, however, the International Agency for Research on Cancer classified formaldehyde as carcinogenic to humans. The US and most world health organizations now recognize formaldehyde as a carcinogen or a possible carcinogen for humans. Although some companies still use formaldehyde, the pharmaceutical industry is looking for alternative decontaminants. Chlorine dioxide is a broad-spectrum biocide with the advantage that bacteria, fungi, and viruses do not build up a natural resistance. Chlorine dioxide has emerged as popular replacement of formaldehyde. Chlorine dioxide offers the most thorough decontamination possible in the safest manner without producing any carcinogenic by-products. With these entire advantages, chlorine dioxide decontaminates the vessels, reactors, headspace, process tanks, and filtration units. Chlorine dioxide effectively reduces the downtime. With the recent and quite sudden withdrawal from sale of clear soluble phenolics, as a result of the European Biocidal Products Directive, many laboratories have been involved in a rapid search for suitable alternative disinfectants. One such alternative is chlorine dioxide, already well-established in hospitals for instrument decontamination and hard surface disinfection, and now finding an increasing role for decontaminating equipment, reactors, vessels, filtration units and processing tanks in the pharmaceutical formulation units. Rapid Oxide Tablets is a chlorine dioxide generating Tablets. There is no “chlorine dioxide” in the Tablets. It generates chlorine dioxide when comes into contact with water or when exposed to moisture in ambient air. It is the easiest way to deliver high purity chlorine dioxide at the point of use. Tablets are the most ideal for small and medium applications. Step 1: Cut the Rapid Oxide Tablets from packaging. Step 2: Drop into water wait for proper dissolve. 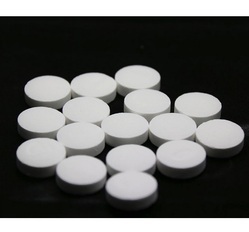 Rapid Oxide Tablets - 10gm: 1 ppm Chlorine Dioxide in 1000 liter water. 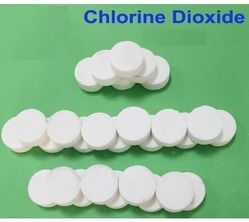 Rapid Oxide Tablets - 20gm: 1 ppm Chlorine Dioxide in 2000 liter water. Rapid Oxide Tablets - 30gm: 1 ppm Chlorine Dioxide in 3000-liter water. 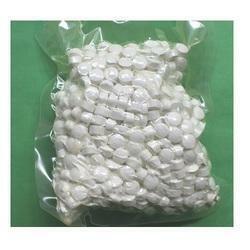 Rapid Oxide Tablets - 40gm: 1 ppm Chlorine Dioxide in 4000-liter water. Rapid Oxide Tablets - 50gm: 1 ppm Chlorine Dioxide in 5000-liter water. 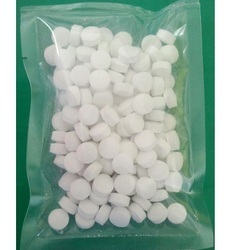 Rapid Oxide Tablets - 100gm: 1 ppm Chlorine Dioxide in 10000-liter water. Looking for Chlorine Dioxide Tablets ?